The Art of M.A. 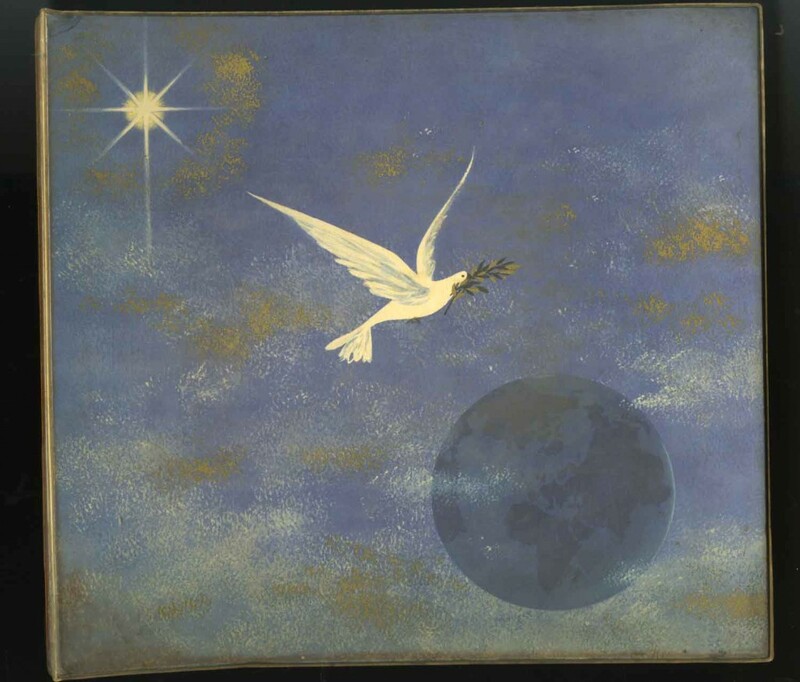 Rahman Chughtai was getting very popular in the United States in the 1950s. R.C. Stone (Rose Stone) an American printer and publisher went on the Peace Offensive in the United States. Forgetting about her regular business, she turned her resources towards PEACE in the world. What was happening in Vietnam was repugnant to these thinking Americans and they were trying their best to do good. A number of Americans had fathered illegitimate children in Vietnam, and these American children were languishing on the streets of Vietnam’s cities and villages. Rose Stone made it her job to get Visas for these children and she made a SOS VILLAGE for them, and gave them an opportunity to be part of the American dream. 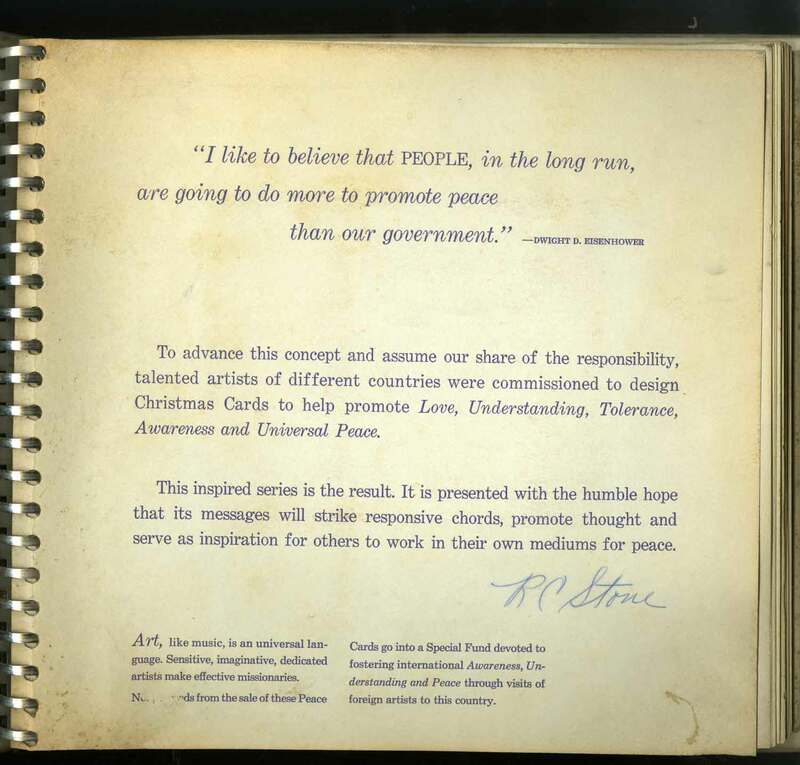 In this quest Rose Stone embarked upon a PEACE PROJECT. She selected the best artists of most countries in the world, and gave them a task of contributing PEACE CARDS for her project. The best artists of the world presented her their homage for peace. In Pakistan, she approached M.A. Rahman Chughtai. She came here on her own to request the artist to do same and the artist obliged her. The album of Cards is still with us. 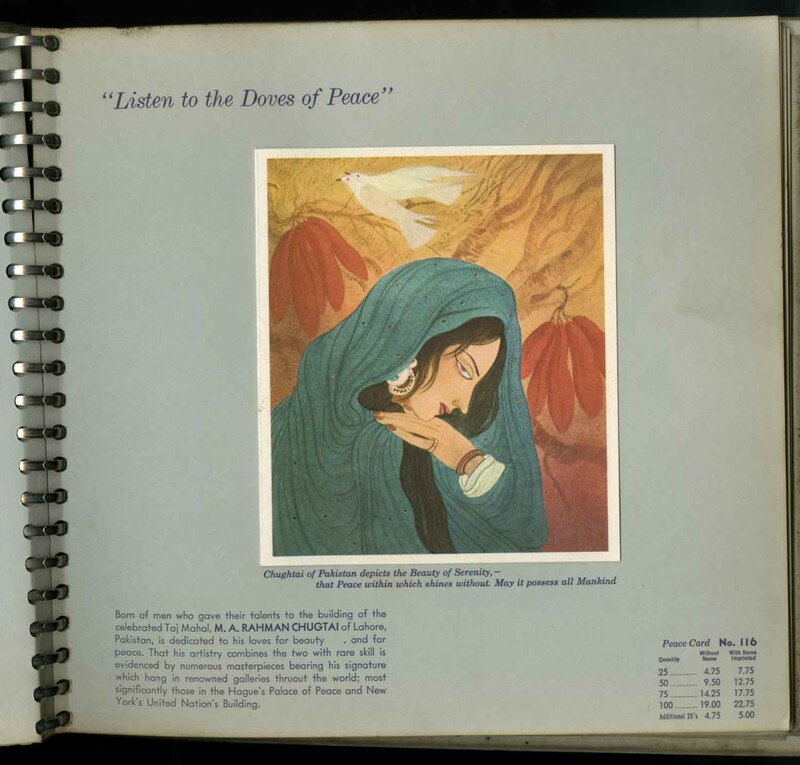 The Cards of M.A., Rahman Chughtai not only fostered PEACE in the world but promoted Pakistan as being part of same. I met her again in New York in 1976, and we talked of many things. I recently came across another group of artists again in California , working on the same theme. I was amazed, Rose Stone stood forgotten in modern times. With access to the Senate in her life time, she stood forgotten. I asked the esteemed lady artist Lisa Shultz to do something in memory of Rose Stone, peace maker of the world. When we sit here we know of the U.S.A as their Government would like us to know. But when you meet Americans, talk to them, be with them, you realize a friendly nation believing in goodness, and yes, thousands yearn for peace all the time. It is for us to give people like ROSE STONES a chance to tell us about the real face of America. It is for us to cooperate with Lisa Schultz in her peaceful endeavour.